In recent weeks ISIS has been forced onto the defensive inside Syria and Iraq. The intervention of Russia has allowed the Syrian army to make some progress in the fighting. In response, the US, concerned not to lose ground before negotiations, has stepped up its armed actions in Syria and Iraq. Also Kurdish forces in both Syria and Iraq have advanced, notably with the liberation of Sinjar. Under such pressure ISIS has activated terrorist units, which have most likely destroyed the Russian Metrojet flight over Sinai, bombed a Shia area in Beirut, and co-ordinated the terrorist attacks in Paris. Terrorising civilian populations and slaughtering them for propaganda purposes is characteristic of ISIS. Its primary mode is coercion, its ideology is deeply sectarian and most of its victims are Muslims. Also most of the people militarily fighting ISIS are Muslims. There must be no ambiguity amongst socialists, we support the victims against such vile politics and want to see ISIS defeated. The West has greatly strengthened terrorism with its military interventions in the Middle East. Before the US and Britain invaded Iraq in 2003 Al Qaeda type currents were small and marginal forces across the whole region. Since then and the West’s bombing campaign in Libya, these armed groups have spread across the region, plus have sponsored increasing attacks against Western targets. Part of the origin of ISIS can be directly traced to the US prisons inside Iraq. Whilst detained by the US, Abu Bakr al-Baghdadi met with Al Qaeda contacts and the nucleus of terrorists who formed ISIS. A futile war and occupation, which cost hundreds of thousands of lives, guaranteed there would be an audience for any desperate response. Western intervention in Syria since 2011 has further fuelled the growth of ISIS. US imperialism and its allies have focused on securing regime change by supporting, training and arming an opposition to the Assad government. Kuwait, Qatar, Saudi Arabia and Turkey all ensured considerable arms and fighters were imported for different parts of this opposition. This opposition is now dominated by violent sectarian militias including ISIS, Jabhat al Nusrah (Syrian affiliate of Al Qaeda), and Ahrar al Sham which up to his death had been led by Abu Khalid al-Suri. The latter was the representative of Al Qaeda leader, Ayman al-Zawahiri in the Levant. Ahrar al Sham continues to operate through agreements with al Nusrah and ISIS. Whilst other sections of the armed opposition have condemned the Paris attacks these organisations have refused to. One thing is certain, Western bombing will not defeat ISIS and the other sectarian forces. Only a political process that allows the people of Syria to decide their future offers a chance of peace. New negotiations involving the US, Iran, Russia, China, EU, UN, Turkey, Saudi Arabia, etc, offer the possibility of establishing a peace process. Conditions need to be secured which ensure the participation of the Syrian government and the patriotic forces amongst the opposition. Such a process would isolate ISIS and other sectarian militant currents, laying the basis for their military defeat by Syrian and Iraqi forces. The massacre in Paris is resulting in a further ramping up of Islamophobia, and hostility to refugees. Since 2001, some mainstream politicians have freely indulged in singling out Muslims at home, in order to justify the bombing of Muslim countries overseas. Far right and fascist parties in the EU have consistently grown from such pandering to racism. In the coming months, progressives in Britain and across the EU need to defend the Muslim community from the inevitable physical and demagogic attacks. 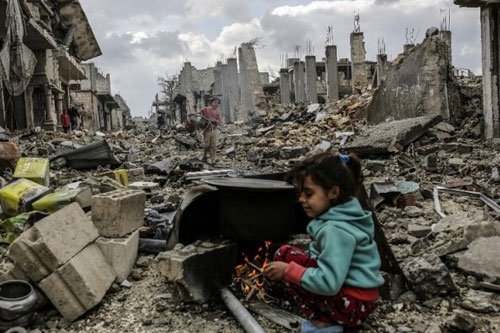 Many Western politicians still refuse to acknowledge the failure of a policy that has brought suffering and chaos to Afghanistan, Iraq, Libya and Syria. This refusal adds fuel to the forces of Islamophobia and racism in the EU. Remarkably, those who have been fleeing these wars, i.e. the refugees, are now being marked by some as the source of terrorism. Refusal to acknowledge Western responsibility for assisting the refugees goes hand in hand with refusing to accept responsibility for creating these refugees. It is vital to keep promoting a welcome for refugees. Just as Al Qaeda was a by-product of Western intervention in Afghanistan in the 1980s, so ISIS is a by-product of Western intervention in Iraq and Syria this century. Such poisonous forces will not be defeated by those who have trained and armed them in the past. The continued ambition of the Tories to commence bombing in Syria are now being clothed as the appropriate response to the Paris attacks. Such an approach has correctly been rejected by Jeremy Corbyn. Cameron and Labour’s right wing are trying to exploit the Paris tragedy to cajole reluctant MPs into supporting British military intervention into Syria. But public opinion is firmly on Corbyn’s side. Survation polling reports that just 15 per cent support Britain carrying out immediate air strikes on Syria in retaliation for the Paris atrocity. 52 per cent back a co-ordinated international response that is backed by a United Nations resolution – the core of the position the Labour Party agreed at its September conference. 56 per cent believe the current Western air strikes have made the UK less safe. The Stop the War Coalition has committed itself to continue to prioritise a campaign against attempts by the Tories to secure Parliamentary support for military action in Syria. Only the people of the Middle East can settle final accounts with ISIS. The progressive and labour movement must insist upon a political solution, and real contributions to post war reconstruction in Iraq and Syria.